Many people leaving the Garden State Parkway at Exit 89 or driving on Cedar Bridge Road wonder what activities occur under the steeply pitched roofs of the unique building known as One Airport Road, Lakewood, New Jersey. That iconic building is the home of the Bathgate Wegener & Wolf law firm. Our law firm employs 45 people and we occupy the entire building. Our unique building has been named in an architectural guide book as one of 150 Best Buildings in New Jersey. This truly unique building was designed by Noboru Kobayashi. The architectural guide book describes the building as having a “spare and elegant design … made up of pure geometric forms that recall both Shinto temples and the Louis Khan Bath House in Ewing Township. The complex consists of nine square pavilions of ascending dimension offset from each other on diagonal axes. The pavilions are capped with steeply pitched pyramidal roofs covered by wood shingles”. From the unique roofline it might seem there are several buildings. Actually, there is only one building that has a roofline consisting of nine pyramids. Although it appears that the pavilions are separate structures, the building has a unified floor plan consisting of several intersecting ovals. ​Beginning with its stone entry terraces, the building has many unique features. Our main entrance is framed by fountains, a moat and a waterfall. The fountains are not only visually dramatic but also generate a pleasing sound as the water cascades down the waterfall and is propelled high into the air before splashing into the largest of the reflecting pools. ​The interior of the building is graced by two gardens that provide a very pleasing internal landscape of shrubbery and flowers. One of those gardens has its own pool. The internal gardens, open to the sky, provide light and air that enlivens the interior of several of the pavilions. ​The reception area has a soaring ceiling capped by a glass peak and brick walls that are accented by the soft glow of wall mounted lights. From that vantage point our clients and visitors are able to view the interior gardens. ​A truly attractive feature of one of the pavilions is a library constructed as a room within a room. This pleasing architectural dimension permits access to our bound book collection without the stacks of shelves typically associated with traditional libraries. In our modern law firm, each of our 45 individual computer terminals has direct access to the latest version of computerized legal research software. ​Anyone who is interested in touring the public areas of the Bathgate Wegener & Wolf, P.C. office will have that opportunity in conjunction with the upcoming immigration seminar that we will host. ​To discuss the unique characteristics of the Bathgate Wegener & Wolf, P.C. building or legal issues please call partner William J. Wolf (732-363-0666). For more information regarding Bathgate Wegner & Wolf, please visit our website at www.bathweg.com. In Part 1 of this series, we looked at four different scenarios when a Power of Attorney or Guardianship might be appropriate. We also looked at the basic requirements to begin a Guardianship application to the Court. In Part 2 of this 3 part series, we discussed the court hearing process, the possibility of the appointment of a Temporary Guardian, and the bonding requirements for a Guardian. In Part 3 of this 3 part series, we discuss some of the tasks that must be performed by the Guardian, the reports which must be filed by the Guardian, and the compensation that a Guardian may receive for performing his or her duties. ​Congratulations! You’ve been appointed as Guardian of your loved one. Just when you thought your involvement with the Court is over, now the Court oversight begins. Being appointed as Guardian imposes significant responsibility and record-keeping. Further, once the Court appoints you as Guardian of your loved one, you do not have unfettered rights to your loved one’s assets, income and health care decisions. If the Guardian wishes to sell any of the incompetent person’s property, the Guardian must make an application to the Court to do so. Similarly, Court approval is necessary if the Guardian seeks to gift assets for the purpose of estate or Medicaid planning. (NJSA 3B:12-49, 3B:12-58 and 3B:12-59). The Guardian must complete several reports each year, beginning with an initial Inventory of Assets. This initial inventory is usually due within seven (7) to thirty (30) days of the appointment. Further, each year, the Guardian must complete a Report of Well Being of the incompetent person and must also complete an Accounting of all funds that the Guardian has handled during the year, all income received, and all expenses that the Guardian has paid. Both of these annual reports are submitted to the Surrogate Court of the County that decided the Guardianship Application. If the Court has any questions regarding the reports, the Guardian may have to provide supplemental information. $5.00 for each $1,000.00 of principal corpus for the first $400,000.00, and $3.00 for each $1,000.00 of principal corpus on amounts exceeding $400,000.00. Therefore, by way of example only, if the incompetent person has assets totaling $1,000,000.00, and receives $100,000.00 worth of income in a year, the Guardian is statutorily entitled to $3,800.00 on the principal and $6,000.00 on the income for a total annual commission of $9,800.00. ​The Guardian may also receive a termination/distribution commission. The amount of the termination/distribution commission is based, in part, not only upon the value of the assets, but also upon the length of time the Guardian has acted as Guardian when the termination or distribution occurs. These termination commission amounts are set forth in NJSA 3B:18-28. Being appointed a Guardian for your loved one imposes certain record-keeping and report filing requirements. Once you are appointed Guardian, the court involvement in your loved one’s estate does not end. While the Guardianship application process is concluded, the Court oversight begins. This Court oversight continues until the Guardianship is terminated. The best way to reduce the expenses associated with a Guardianship is to discuss and finalize your estate plans, long term care plans and Power of Attorney preferences with a knowledgeable attorney while you are still mentally competent and can make those decisions on your own. As our society ages and as the law continues to recognize the independent legal rights of “children” once they reach eighteen (18) years of age, the need for Powers of Attorney and Guardianships is becoming increasingly important. Having a Power of Attorney or estate plan is no longer limited to the rich and famous or elderly; even college-aged children should consider having Powers of Attorney in place. If there are questions regarding your or a loved one’s mental competency to sign a Power of Attorney, ask your family physician or neurologist to perform a competency exam such as the mini mental status exam. If your loved one does not have the mental capacity to sign a Power of Attorney, all is not lost. An alternative to the Power of Attorney is a Guardianship for your loved one. A Guardianship requires an action in court and physician/psychologist certifications. Navigating the maze of Guardianship applications on your own can be both confusing and overwhelming. Because the Guardianship process requires a Complaint being filed with the Court, a copy of the Complaint will be provided to your loved one over whom you seek Guardianship. This may cause tension and misunderstandings between you and your loved one if you make the application on your own. Having an attorney to prepare the Guardianship application and to guide you through the Guardianship process can help reduce the confusion, sense of overwhelming, tension and misunderstandings. Pamela M. Snyder, a partner with the law firm of Bathgate, Wegener & Wolf, P.C. located in Ocean County, New Jersey, focuses a portion of her practice on estate planning, guardianships, Powers of Attorney, Wills, Special Needs Trusts and probate litigation in Ocean and Monmouth Counties. Nearly four years after Superstorm Sandy made landfall in Ocean County, NJ, a jury has rendered its first verdict in favor of homeowners against a home improvement contractor repairing Sandy damage. In August, an Ocean County jury sided with the homeowners in their suit against Price Homes Group (PHG). PHG was a fledgling home building contractor that, like many others, spawned in the aftermath of Superstorm Sandy. The entity was formed 100 days after the most powerful storm to affect the Jersey coast made landfall. The storm caused billions of dollars in property damage as a result of wind and flood. Despite being newly formed, PHG enjoyed the illustrious status of being a “qualified builder” under the State’s RREM (Reconstruction, Rehabilitation, Elevation and Mitigation) Program administered by the Department of Community Affairs (DCA). Under the RREM Program, the DCA checked whether a contractor was a registered Home Improvement Contractor licensed to do business in New Jersey, and whether it had been debarred from doing business with the government. By now many have heard horror stories of the RREM program. RREM later allowed homeowners receiving such grants to select their own contractors. Sadly, in spite of a trial victory for the homeowners, whether they will ever see any of the $300,000 in damages awarded against PHG remains to be seen. The three principals of the company have declared bankruptcy and PHG vows to appeal the verdict. There are at least fifteen other such suits against PHG. The toll-free number of the NJ Division of Consumer Affairs. A contractor that fails to comply with the CFA runs the risk of exposing itself to a consumer fraud action, in addition to the standard breach of contract action by a homeowner that the work does not meet the terms of the contract and is not completed in a workmanlike manner, and/or consistent with applicable building codes. Any contractor found to have caused an ascertainable loss as a result of a “deceptive business practice” and to comply with the Act’s requirements, runs the risk of not only damages for the costs of repairs to properly complete the project, but also treble (tripling of) damages, attorney’s fees and costs of suit. There is New Jersey case law that further allows such damages to be assessed against the principals or officers of a corporation (“pierce the corporate veil”) if actual participation in such deceptive business practice by the principal or corporate officer is shown. While budgets may be strained by any contemplated home improvement project, it behooves a homeowner to have a consultation with a qualified attorney before blindly wading into the treacherous waters of home improvement. If you earn your living as a New Jersey Home Improvement Contractor, you must be aware of your legal obligations. 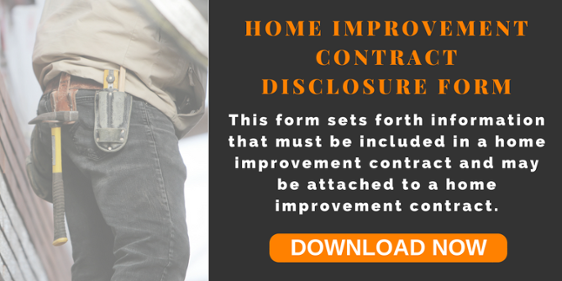 You must register with the Division of Consumer Affairs consistent with the Contractor Registration Act and be sure your contracts are Consumer Fraud Act compliant, otherwise your next project may be “on the house”. A home improvement contract that fails to comply with the CFA is deemed void and the contractor’s only right to receive compensation for such work and materials is the value of such services and materials provided (quantum meruit) without any profit. It has been held that even quantum meruit recovery is questionable because the purposes of the CFA are to punish the wrongdoer and deter others from such conduct. Brian McAlindin, Esq. is a Partner at Bathgate, Wegener & Wolf, PC and a Certified Civil Trial Attorney with expertise in construction litigation on behalf of both homeowners and contractors, as well as personal injury actions. Although not favored in the law because they interfere with one’s right to use and enjoy real property, restrictive covenants are enforceable. Restrictive covenants limit how a property owner can use his property and what he can build on property. Generally, the restrictions are contained in the deed that transfers the property or some document that relates to the property, like a subdivision approval. Typical restrictions prevent houses of a certain size or style to be built on the property or limit the property to residential or commercial use. Restrictions that limit one’s use and enjoyment of property cannot be disregarded by the owner of the property, but relief may be available to a property owner who wants to remove the restrictions. Historically, courts enforce restrictive covenants that are contained in a deed or other document that is within an owner’s chain of title. If the restriction is “clear, explicit, and unambiguous,” and does not violate public policy, it will be deemed valid on its face and will be enforced by a court. For example, a restriction that limits the height of houses in a particular neighborhood so that all of the property owners retain unobstructed water views is enforceable because it is clear, explicit and unambiguous. Conversely, a restriction that prevents a property from being sold to members of a specific race, religion, or ethnicity is unenforceable because it violates public policy. First, if the restriction is applicable only to a neighborhood of defined properties, the restriction can be rescinded if all property owners unanimously agree to remove the restriction. Second, if the restriction has been continuously not enforced, a property owner against whom enforcement is now sought may file a lawsuit to prevent enforcement of the restriction by establishing that the restriction has been abandoned. Third, a property owner against whom a restriction is sought to be enforced may seek to invalidate the restriction by filing a lawsuit and establishing “changed conditions” in the geographic area affected by the restriction. In deciding whether there are changed conditions, the critical inquiry for a court is to determine what benefit the restriction is intended to bestow on the public and whether it would be unfair to enforce the restriction in light of that intended benefit and present day realities. Restrictions on the use of property are enforceable even though they interfere with a property owner’s right to use and enjoy real property. These restrictions, however, may be removed in certain circumstances. If your property is subject to a restrictive covenant or you seek to enforce a restrictive covenant, you may reach out to Michael M. DiCicco, Esquire. Mr. DiCicco, a partner at Bathgate, Wegener & Wolf, has successfully represented property owners seeking to enforce and eliminate restrictions on real property. ​In Part 1 of this series, we looked at four different scenarios when a Power of Attorney or Guardianship might be appropriate. We also looked at the basic requirements to begin a Guardianship application to the Court. In Part 2 of this 3 part series What Is Guardianship In New Jersey and How Does It Work, we discuss what will happen at the court hearing. Approximately 2 weeks after the application to have your loved one declared incompetent is submitted, the Court will set a date for the initial hearing. Once the initial hearing is scheduled, the person who seeks to be appointed as the Guardian must notify the alleged incompetent, his or her next of kin and anyone else who has a degree of relationship superior to that of the applicant of the date and time of the hearing, and the person’s ability to challenge the application. In certain circumstances, the Office of Public Guardian must also be notified of the application and given an opportunity to review and respond to it. The next of kin or other interested party may hire an attorney to represent their interests in the application or they may represent themselves, pro se. The next of kin or interested party is permitted to challenge both the requested declaration that your loved one is mentally incompetent and your appointment as Guardian. Because your loved one will receive a copy of the filed papers, your loved one will be advised not only that there is a request to have him or her declared mentally incompetent, but also of the name(s) of the person(s) seeking Guardianship. On occasion, the Court will appoint a Temporary Guardian for your loved one while the Guardianship application is pending. The Temporary Guardian serves until the Court makes its final determination regarding a permanent Guardian. The Temporary Guardian can be the person(s) submitting the application for Guardianship, or it can be someone else selected by the Court. If the Court does not appoint the applicant as the Temporary Guardian, the Court may appoint an attorney (separate from the court appointed attorney who will represent your loved one in the Guardianship application process) or an accountant or other professional as the Temporary Guardian. The fees charged by the Temporary Guardian are usually paid from your loved one’s assets. The Court will appoint an attorney to represent your loved one. The Court appointed attorney is not free. He or she is usually paid from the assets of the alleged incompetent. This attorney will not only present your loved one with a copy of the papers submitted to the court, but will also spend some time with your loved one, interview him or her, will likely interview the guardian applicant, and will research whether your loved one previously signed a Power of Attorney or a Last Will and Testament. Once the Court appointed attorney’s research and interviews are complete, she will submit a report of recommendations to the Judge. Although the court appointed attorney represents your loved one, your loved one may hire his or her own private attorney at your loved one’s own expense to represent his interests and challenge a Guardianship application. If the Guardianship Application is not contested and the Court appointed attorney agrees with the Application, then the Court may not require anyone to be present at the hearing and the Judge will make his decision based upon the papers presented to him. However, if the Guardianship Application is contested, during the initial hearing the Judge will consider: (a) the written papers submitted to it that support and oppose the Guardianship, and (b) oral arguments (but not witness testimony) regarding the Guardianship Application. Usually, live witness testimony is not presented to the Court during the initial hearing. In both contested and uncontested Guardianship Applications, the Court will review and consider the observations and recommendations of the court appointed attorney. Sometimes, the Court decides that it does not have enough information to make an immediate determination on the Guardianship application. If that is the case, the Court will schedule another hearing and may request that additional information be submitted to the Court. At the second hearing, the Court may hear sworn testimony from (a) the person alleged to be incompetent, (b) the person applying to be the Guardian of the alleged incompetent, (c) the physicians, psychologist or psychiatrist who conducted examinations of the alleged incompetent, and (d) any other persons with an interest in the application or who have information regarding the alleged incompetent. Only after receiving all the information, evidence and testimony that the Court deems necessary and appropriate, will the Judge decide whether your loved one needs to have a Guardian appointed, and if so, who will be appointed the Guardian. In addition to deciding whether your loved one is mentally incapacitated and who should serve as Guardian, the Court will also decide the amount of the bond, i.e., insurance policy, that must be obtained by the person appointed as Guardian. The amount of the bond is generally based upon the value of the assets of your loved one. The bond is obtained by the potential Guardian, usually after a general background check, credit check and payment of a bond premium. The bond premium must be paid every year, and usually can be paid from the incompetent person’s assets. If your loved one does not have the mental capacity to sign a Power of Attorney, all is not lost. An alternative to the Power of Attorney is a Guardianship for your loved one. A Guardianship requires an action in court and physician/psychologist certifications. Because the Guardianship process requires a Complaint being filed with the Court, a copy of the Complaint will be provided to your loved one over whom you seek Guardianship. Additionally, the next of kin of the alleged incapacitated person, along with those person(s) who have a degree of relationship superior to the applicant requesting to be appointed as Guardian must receive notice of the application. This may cause tension and misunderstandings between you and your loved ones if you make the application on your own. Only after a Judge is confident that he or she has received and reviewed all of the evidence and testimony necessary to make a determination regarding your loved one’s mental competency and appropriateness of a Guardianship will a judge make his or her ruling. If a Guardianship is granted, that ruling will include a Judgment of Legal Incapacity, the name of the person appointed as Guardian and the amount of bond that will need to be secured before the appointment of the Guardian can be finalized. Having an attorney prepare the Guardianship application and guide you through the Guardianship process can help reduce the confusion, sense of overwhelming, tension and misunderstandings that can accompany a Guardianship application. In Part 3 of this 3 part series, we will discuss a Guardian’s duties after being appointed by the Court. Pamela M. Snyder, a partner with the law firm of Bathgate, Wegener & Wolf, P.C. located in Ocean County, New Jersey, focuses a portion of her practice on estate planning, guardianships, Powers of Attorney, Wills, Special Needs Trusts and probate litigation in Ocean and Monmouth Counties. ​ Contact Pamela at 732.363.0666 or psnyder@bathweg.com.